How many ways of using a pen could you come up with in two minutes? I managed to write down 10. Actually that’s not very creative. Some people can easily think of even 20 or more ways. They are more trained in Design Thinking. We, the SID group of 2013, started our Service Innovation and Design MBA this fall by diving into a very elementary field: Design Thinking and innovation. We were guided by Katja Tschimmel and Gijs Van Wulfen to complete our own innovation journey using the FORTH-innovation modelsqueezed into just two days. The two day innovation exploration was interesting and fun. 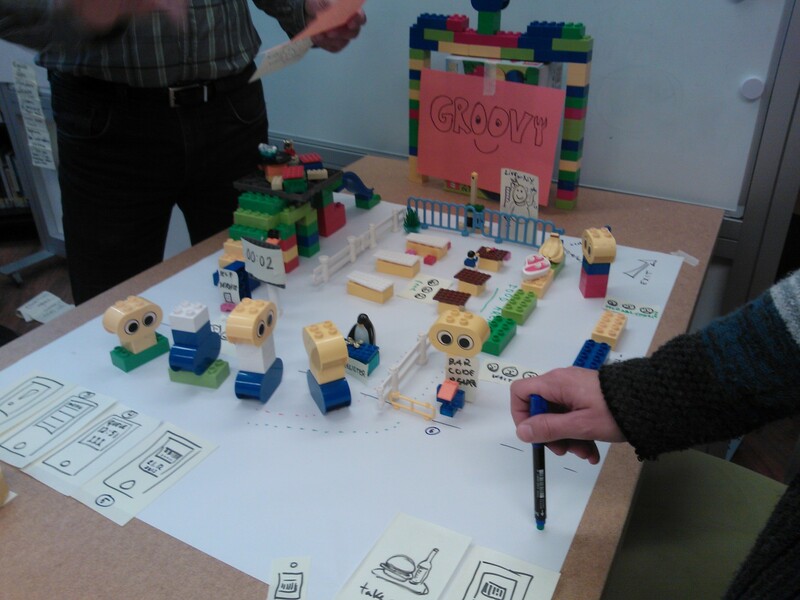 We had a blast creating a desk top walk through of our fictional service “Groovi”. Some of my important learnings were that I should first think outside of the box but not to be too “designery” in presenting my ideas. They might be accepted easier if they feel like coming from the box. Communicating my ideas is definitely a skill in which I want to get better at. Another important discovery was that facilitating an innovation process is a very demanding task and I have to practice that. So basically there is the attitude and mind set and then there are the tools. The concepts and words have been floating in my mind for weeks and in order to reflecting them a bit I started to write them down and noticed that they make up the entire alphabet…or almost. Atmosphere: When facilitating an innovation or design process you should build an atmosphere of trust where people feel at ease and ready taking risks and trying out new things. Brainwriting: Very useful technique for brainstorming. The group writes down ideas to post its and sticks them to a wide sheet of paper. Everyone can immediately see each other’s ideas, improve and build on them. Convergent/divergent: In a design process you should constantly wide and narrow your band. First expand your vision, don’t’ get stuck with just obvious and existing solutions (divergent thinking). Then reverse the process and keep narrowing options until you have the most promising ones left (convergent thinking). Desk top walk through: Good way to make a rapid prototype of your service, communicate it and get feedback for improving. You can use sketching, prototypes, Legos etc. Empathy: If you want to create good services you have to know your users and stake holders. Personas and Empathy Maps will help you in this. Fluency: When you are thinking divergently, be fluent. Don’t get stuck but just let your thoughts and ideas flow. Group: Design Thinking is about collaboration. You work with the group having shared goals and contributing with your own knowledge, skills and expertise. Don’t think of the ideas as your own. It’s joint property of the group. Human-centric, human-driven: In order to be human-centric you must dig deep into your user’s needs and dreams. Use intense observation with all your senses. Be empathetic. Joining cross-diciplinary expertise: “Collision of unusual suspects” is a great starting point for innovation. People with different backgrounds and skills are more likely to create something new. Katja Tschimmel: Lecturer and coach, researcher and consultant, conference speaker and facilitator. Design Thinker. Learning: Innovation process and using Design Thinking tools is about constant learning, experimenting and improving the ideas and concepts. Mind map: Is most likely one of the most familiar Design Thinking tools for non-designer. In a mind map you give a visual form to complex information. It helps seeing patterns and connections and extracting meaning. Start a mind map from a central theme, add labeled twigs and branches. Use colors, images and symbols. They help to stimulate connections and make the outcome clearer. Narrative thinking: Opposite of abstract thinking. You think in stories and are telling them. You don’t just spell out isolated fact but use narratives which flow and are coherent. Observe: Design Thinking uses observation to find problems and frictions that are waiting to be solved in the end users life. You go out to the field. You observe and learn. Persona: Tool based on fictional character created out of gained insights. It helps you making the end user more personal and human. Makes it easier to get touch with experiences users are having. Works as an impulse for generating ideas how to improve experience. Quick prototyping: In innovation process, you should make fast prototypes. They make the ideas feel more real. Make “low-fidelity” prototypes which are just good enough to be shared. Prototypes are helpful tools for getting feedback, learning and improving. Reflecting: Reflecting is an important part of the innovation process. Reflect on your observations, experimentations and the feedback you are getting. Storytelling: Humans are storytelling animals. Strorytelling can be used in sharing new concepts and communicating them. The emotional context of a story makes your presentation more compelling, engaging and memorable. Toolkit: Build your Design Thinking toolkit. Learn the methods; get your Legos and post it’s. Learn to sketch and use mind maps. User Experience: In services the user experience is a key concept. Crappy UX = crappy service. Visualization: Designers use lot of visualizations, the “mother of all design tools”. Transform information into pictures and images. It’s easier to solve a problem or communicate a concept when it’s visualized. Use tools such as sketching and mood boards. Wondering: Design Thinking is about being open minded, challenging the conventional ways of perception, wondering and observation. X-factor: Innovation is tricky thing. Only 1/7 of innovation projects will succeed. You can never be totally sure. With right tools and methods you can improve your odds. edit: 21.10. at 14.35 Mussab Sharif and Titikshya Mohanty helped with Y and Z. Thanks guys! Zero business case at start with a need not numbers. Later convert to initial numbers that can be understood. Contact sessions at SID Laurea on 13-14 September 2013. Katja Tschimmel’s paper “Design Thinking as an effective Toolkit for Innovation” In: Proceedings of the XXIII ISPIM Conference: Action for Innovation: Innovating from Experience. Barcelona. Liedtka, Jeanne & Ogilvie, Tim 2011. Designing for growth: a design thinking tool kit for managers , New York: Columbia University Press. Idris, Mootee 2012. Design Thinking for Strategic Innovation. What They Don’t Teach You at Business or Design School, New Jersy,: John Wiley & Sons Inc. Expanding creative skills to everyone in every industry is one of the most wonderful experiences we have in our job every day. Pens, Toys, Games, Stories and images are great solving problem tools and have always been. We are currently developing Systems and strategies using this tools so let´s keep updated for more. Nice structure! This is a great summary! But you made some very good points at the beginning of your posts. I specially like the part of not presenting ideas in a very “designery” way. In my mind this is clearly linked with Mussab’s post about Besign Thinking. Don’t make really cool and worth noting ideas alien to decision makers! Speak their language, or at least a language they can understand. Good work Mervi! I found your ABC really helpful and was thinking a bout printing it out. Maybe you should write a handout of it and give it to all new SID students! 😉 Or then the course could ask all the new student to fill their own Design Thinking ABC…why not! ?